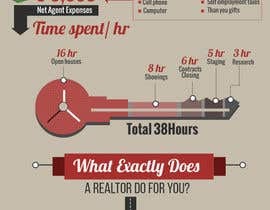 INFOGRAPHIC for "Real Estate Agent Job"
- I need a really nice and modern Infographic to show that real estate Agent are doing much more than what people think. In my COuntry most of the people think "they are earning too much just for opening a door with a key" But in Reality its not the Case. SO the goal of this Infographic is to change the way people think of this Job and the public Image. - I will add the Text informations by myself ( since i dont use illustrator ( only Photoshop) maybe it would be cool if you can provide a photoshop file with layers...) The Infographic will be in german. 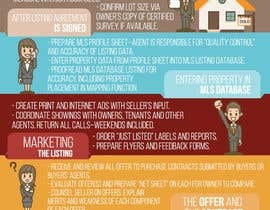 "Wow its a nice infographic"
"i didnt know real estate agents are doing so many things"
"Now i understand why they are earning that comission"
"its hard but its a cool Job "
I want to do more Infographics in the future about "real estate Agent - job " SO if you are creative we can work together in the future. BE creative and show me what you ve got !! - the " day in the [login to view URL]" picture i uploaded definitely has the effect i want ( real estate agent have a lot of things to do " ) but i want this message communicated in another way , more appealing. SINCE I WILL NEED MORE INFOGRAPHICS IN THE FUTURE EVEN IF YOU ARE NOT THE WINNER I CAN HIRE YOU FOR FUTURE JOBS IF I LIKE YOUR STYLE. Please select the winner for this contest. We are waiting for your decision. Thanks for inviting, working on it ! 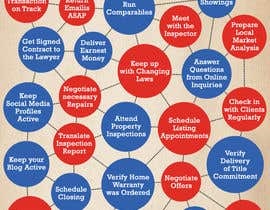 2 important effects for people looking at the infographic => 1 ) " WOW really appealing infographic" 2) => "Now i know that real estate agents do a lot of things to be able able to sell houses, its not a " do nothing " and be rich fast JOb." #2 can you create more than 3 categories with this guy you used? the agent sitting in a car ? sitting in front of the pc ( doing marketing)? agent talking on the phone,.. Things like that. YOur design is somehow fine but its too short. someone can read it in 20 seconds and thats it. #2 i want the people to spend more time looking at it. Hi there, I will submit an entry later on. because as i said the perception is that realtor dont do nothing, they just open the door and cashing in the money ;-) because of some common misconception because of tv shows , the people believe that they dont deserve to earn their comission and they are earning too much. SO i want to show that they are doing a lot . #2 thank you i like your entry because its clean and not overloaded BUT the effect i want to reach is that people understand that realtors do a lot of things so i just need more Data... you created 3 Categories / situations i think i will need 10. I know that 184 may be too much but 10 categories and 10 tasks per categories would be fine. Yes sir, I understood the design concept. I will update my design soon. Thanks for the feedback. the picture i uploaded is called " infogr.jpg"
since its for germany i looked for a german skyline ( BERLIN) and used it. i uploaded a picture for you to see what i mean . i just created something in photoshop to give you an Idea. Hello, Thanks for your entries. FIrst of all i want to say that even if i dont choose your entry in the End, since i will need more infographics and if i like your style i can contact you for doing other works ! THINK OF SOMETHING DIFFERENT , never seen before :-) and adapt it to the colors of the Website. Thanks ! #1 I like the idea of using the list of all 184 tasks tasks and separating it in some categories !!! Do you other kinds of real estate agents? they look a lil bit unfriendly maybe because of the eyebrows ;-) Do you have other kinds of illustrated persons?